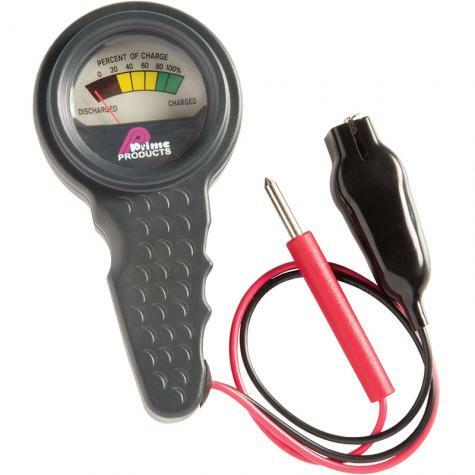 Use with any 12 volt deep cycle battery and for most high grade automotive batteries. To know at a glance how much power you can count on and how much charging your battery may need. Before taking a reading of any battery, first shut off all loads (any device that is attached to the battery). Batteries must be tested "at rest", otherwise the reading will not be accurate. Similarly, if the battery has just been recharged (within 10 hours or so), disconnect the battery from the charger and remove the surface charge in order to obtain an accurate reading. The surface charge may be removed by connecting the battery to a "load" such as a motor, lights, or other devices that the battery is connected to. For best reading, allow the battery to normalize for about 60 seconds after the load has been removed and then take the reading. After the battery has normalized, depress the switch and read the energy level. The meter will automatically light up when the switch is depressed. The gauge displays the percent of charge remaining in the battery. For example, a 60% reading means that 60% of the battery's capacity is available. A reading of 100% means the battery is fully charged. A reading in the "FULL" range means that the battery has a surface charge or that it is under charge. A reading in the "EMPTY" range mean that the battery is dead and should be re-charged. Use an automotive battery with a life rating of 48 months or more. Any 12V DC wet cell battery can be irreversibility damaged if discharged too low. Our rule of thumb: 40% for deep cycles; 80% for common vehicle batteries. It could not be easier or simpler to use. Should have bought this long ago so that I could check battery status in the field. This tool will prolong the life of my battery and help me to keep remote fences properly charged.